Where are the Democratic Leaders When Democratic Officials Are Speaking Out AGAINST Education Oversight in NY? SPRING VALLEY – Educators at a boys yeshiva said Tuesday that the state’s guidelines for a substantially equivalent education would be prohibitive to their students’ studies. His pleas were targeted at a previously ignored 70-year-old law stating private school education needs to be “substantially equivalent” to public school, which gained traction a few years ago when state Education Commissioner MaryEllen Elia updated guidelines to enforce it. WEST NYACK –Several people from the Orthodox Jewish community in West Nyack protested changes being made to religious education. Concerned families and school leaders say they don’t want to change how they are educating students at local yeshivas. “This country was based on freedom of religion and freedom of speech. They’ve had this education for thousands of years. This is why we came out here,” said one protester. The state Education Department held a training session with all of the school districts in Rockland County at BOCES located on Parrott Road. School officials say the state spoke about the need to guarantee that private schools are getting substantial equivalency of instruction that are in public schools. They say it’s to ensure that all students receive the education to which they are entitled. Clarkstown police say a 36-year-old man from Blooming Grove was arrested during the protest for urinating in public. Leaders of Jewish and Catholic private school systems in New York are refusing to accommodate curricula oversight by the state’s Education Department. 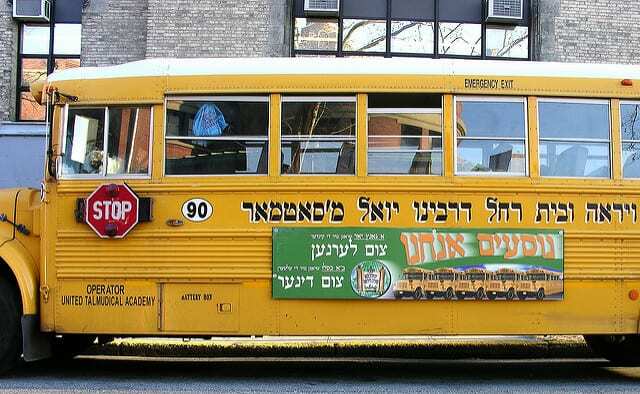 The recent dust-up started in 2015, when news media began reporting on the quality of education offered at another religion’s private schools in New York — ultra-Orthodox Jewish yeshivas — when it became known that their students were mostly being taught the Torah, Judaism’s primary text, but very little about secular subjects, including English, science and mathematics. “As a result, students were emerging from these schools with essentially no skills that made them, employable in any field outside of narrow religious studies,” the Church & State article noted. Because New York government education officials didn’t want to unfairly single out schools of any religious tradition in their oversight of all schools curricula — public and private — they decided to have public school officials inspect each religious school every five years to make sure they were offering adequate instruction in non-religious subjects. As did the Catholic school leaders, officials of Jewish schools also refused to cooperate with state officials in any educational oversight of their programs. Teitelbaum even threatened the take his case to the Democratic Party now dominating the leadership of New York politics. “It wouldn’t pay for them to start a war with all God-fearing Jewry in New York,” he said, according to the Church & State article. So, what is this brouhaha really about? New York public education officials promulgated new guidelines last year to assess the quality of classroom curricula at the state’s private schools and ensure that what they offer is “substantially equivalent” to that of public schools. This means instruction should match that of standard secular subjects taught at public schools. But religious school don’t trust the public school system. “We simply cannot accept a competing school having authority over whether our schools can operate.” (italics mine). In fact, public and religious schools are not in competition with each other. Ostensibly, they are part of a shared educational system whose primary aim is to provide children with a broad, so-called “liberal” education that essentially teaches them about the realities of existence, not necessarily the surrealities (except perhaps in literature and art). The problem is that religious schools tend to want to focus on theology rather than actuality. If you don’t know how huge a problem these schools (including homeschools) are for many of their students, take some time and read posts in the blog titled Recovering from Religion. You might also read a lovely, heartbreaking memoir titled Educated by a young, homeschooled woman named Tara Westover who eventually broke free only discover her almost debilitating ignorance about the real world. Fundamentalist religious schools tend to embrace the idea that anything not of God should not be prioritized. It can an aggressively inward faith of the type promoted by St. Augustine and Martin Luther, who held that reason and knowledge are not only largely unnecessary in human existence but a kind of sin to pursue. Why, Luther asked, try to understand something that is not understandable? Just believe. And if you don’t? Fake it till you make it. Unfortunately, many kids who come out of fundamentalist religious schools often understand a lot about their religions and dangerously little about anything else. This kind of apartheid education should be denounced, particularly in America, whose founders were Enlightenment men who emphatically wanted their new nation to honor fact over fiction, reason over religion, especially in the affairs of state, .